Hello there! 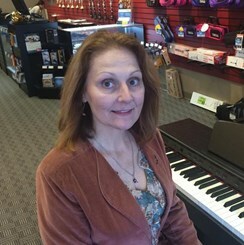 My name is Gayle Kramer and I am a piano teacher here at Music and Arts in St. Peters. I received my Bachelor of Arts in Music, a minor in business Administration, and a certification in Instrumental and Vocal Music. Over the years I have done numerous church performances along with many recitals and music festivals. I have been teaching as a private instructor since 1987 and have taught in various classroms for 5-7 years in schools. When it comes to teaching, I enjoy teaching and watching students grow and enjoy their instruments. My gift to my students is to instill a love of music from their and my instruction.